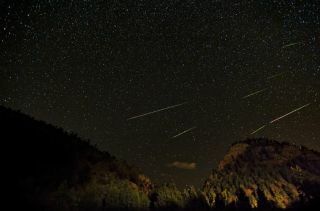 This year's Perseid meteor shower peaks on the night of Friday, Aug. 12 and into the early morning of Saturday, Aug 13. The International Space Station will be making a series of early morning flybys over the U.S. throughout this week and into the weekend, NASA officials said. The massive orbiting complex shines bright enough that its visibility in the sky is not drowned out by moonlight or city lights. NASA's space station tracker lists local flyby times, including those for several major cities such as Chicago, Dallas, Los Angeles and New York, that are expected to have good viewing opportunities on Friday and Saturday. NASA is inviting the public to participate in a Perseids webchat and "all-night" meteor shower viewing party, hosted by astronomer Bill Cooke and his team from NASA's Marshall Space Flight Center in Huntsville, Ala. The webchat will begin at 11:00 p.m. EDT (0300 GMT) on Friday (Aug. 12) and will last until 5:00 a.m. EDT (0900 GMT) on Saturday (Aug. 13). The Perseid meteor shower occurs every year as Earth passes through a stream of dust particles and debris from the Comet Swift-Tuttle. As these specks of comet dust hit the top of Earth's atmosphere at speeds of up to 140,000 miles per hour (225,000 kilometers per hour), they are heated and form bright meteor streaks that can be seen across the sky. Skywatchers around the world are currently counting more than a dozen Perseids each hour, according to NASA and the International Meteor Organization. The light show should reach its peak between Aug. 12 and 13, as Earth orbits near the heart of the comet debris stream. The meteor shower will likely be viewed best under dark country skies, which will help eliminate light pollution. Gaherty also reminds meteor watchers to have patience, as the streaks usually come in bunches, with wait times in between. He recommends budgeting at least an hour or two of skywatching to catch a good glimpse of this year's shower.